I was born and educated in London, and was a student at the Slade School of Fine Art, University College London, from 1965 until 1969. The Slade at the time was small and many of the tutors were artists of the highest rank, especially in the printmaking department where the complex and varied techniques of etching, lithography and silkscreen were expertly taught, with equal emphasis on traditional methods, high quality materials, and innovative techniques. Amongst the inspiring teachers were Antony Gross and Bartolomeu dos Santos, etchers of international renown and technical brilliance. These artists were part of the boom in printmaking during the sixties and seventies and had some of their editions printed at Studio Prints, an atelier set up by Slade graduates, in North London, where I worked for some years. The work at Studio Prints involved proofing with artists; this entails mixing colours and printing the artists’ plates while they would check the printing details to ensure that everything was to their satisfaction. Proofing subsequently entails printing the required number of prints for the edition. It was a period of hard work learning a great deal about etching and making the important first steps in the professional art world. 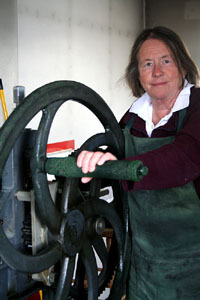 A spell of teaching helped to provide more time for Frances’ own work and during the 70’s, Islington Studio provided the venue for a shared workshop used by artists from around the world with a great exchange of ideas and techniques. I cont inue to exhibit my work in group and individual shows in England and the rest of the world. My subjects are traditional: landscape and architecture. 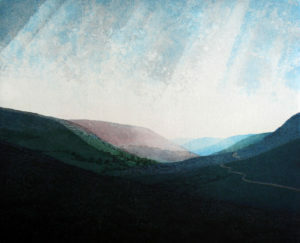 The landscape is now focused on the area of Herefordshire in which I have lived for the past twenty years, my print making strengthened by drawing and painting outside directly from the subject. The emphasis on traditional technique and the highest standards in printing, instilled at the Slade and strengthened through experience, have remained constants in my work. 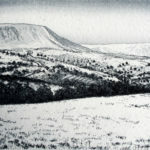 I am a dedicated printmaker and believes that artists’ prints offer the general public a real opportunity to buy art of quality and interest at an affordable price. All the work displayed on my website has been printed by me in my own studio. 1970 Studio Prints, London; subject of a BBC documentary film.